Workers are digging graves for mudslide victims at the Paloko cemetery in Waterloo, Sierra Leone, Aug. 17, 2017. The death toll from the disaster has risen to at least 300, about a third of whom were children. The mudslides began Monday following heavy rains that collapsed a hillside and washed away homes built precariously atop it. Citizens were told they need to identify their dead family members at the overcrowded central morgue by Wednesday night, and mass burials were set to begin at 3 p.m.
President Ernest Bai Koroma, who has been blamed for exacerbating the damage from the mudslide due to his failure to tackle illegal construction in the nation’s capital, is expected to attend the ceremony for those killed. 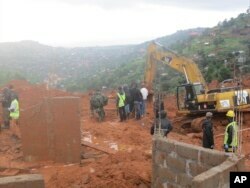 The mudslide occurred early Monday while many Freetown residents were still sleeping, after hours of heavy rains. Witnesses described a particularly hard-hit area in the Regent district, saying roads became "churning rivers of mud." Photos and video posted by local residents showed people chest deep in mud trying to traverse the roads. Rescue workers search for survivors following a mudslide in Regent, east of Freetown, Sierra Leone, Aug. 14 , 2017. UNICEF called the scale of damage from the mudslides “unprecedented” and said its teams have been providing safe drinking water and sanitation to the large number of children affected by the disaster. “Children have been left homeless, vulnerable and terrified. We must do all we can to protect them from disease and exploitation,” said UNICEF Representative Hamid El-Bashir Ibrahim. According to U.N. estimates, more than 600 people are still unaccounted for following the mudslides, and a representative said Wednesday the organization is losing hope they will be found. “It remains a priority to recover the remains of those who perished in the landslide, but also equally to help survivors and help the community,” Saigal said. He said the UN is working with the government to provide “physical protection” for those thousands of people displaced or otherwise affected by the landslide. “We're working with the authorities to prevent disease outbreaks, cholera. You know we're in the rainy season, waterborne diseases are rife, mosquitoes, Malaria is a risk,” Saigal said. The Sierra Leone government has asked for international assistance, and said it’s doing all it can to stem the outbreak of deadly diseases.